SAN ANTONIO DE PINTUYACU, Peru -- Women in this remote Amazon village can weave fibers from the branch of the chambira palm tree into practically anything they need -- fishing nets, hammocks, purses, skirts and dental floss. But for the last year they have put their hopes in baskets, weaving hundreds to build inventory for export to the United States. Their first international buyers are the San Diego Natural History Museum and San Diego Zoo, and they plan to sell to other museums and home décor purveyors like the Field Museum in Chicago and eventually Cost Plus. The circuitous route these baskets have taken from the jungle to American store shelves started with a bird watcher's passion for natural habitats, passed through a regional government whose policies have become increasingly more conservationist, and, supporters say, should end with better lives for the weavers and their communities. The enterprise is one of many ventures here in the Amazon aimed at "productive conservation," which advocates say will save the rain forest by transforming it into a renewable economic resource for local people -- just as some eco-tourism lodges and other ventures in places like Africa and Southeast Asia have tried to do. The greatest challenge has been convincing residents of the communities along the river, who until now largely supported themselves by chopping down palm branches and fishing, that conservation is in their best interest. The government of Loreto, Peru's densely forested and least populous region, organized the basket project, which is financed by grants from two nonprofit groups, Nature and Culture International and the Moore Foundation. "Having the government take such a role in a market-based approach is quite novel," Amy Rosenthal, deputy director for projects at the Amazon Conservation Association, a nonprofit group that works in southern Peru and northern Bolivia, said when told of the program. She said the state of Amazonas in Brazil has tried a similar conservation-exploitation program. "It sounds like a well-thought-out program and something that could be wildly successful," she said. 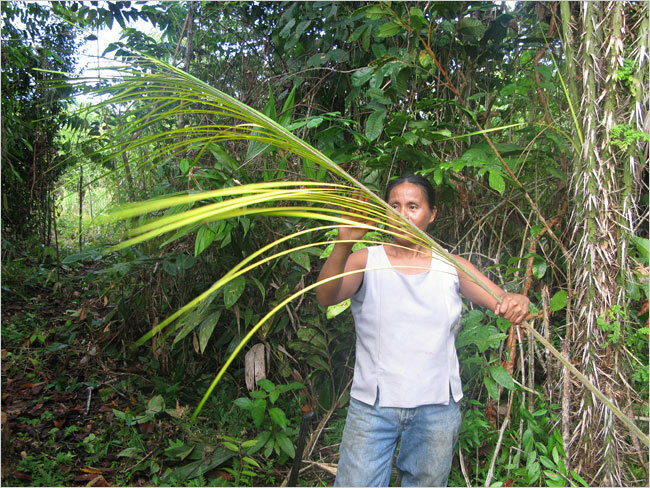 (above) Angela Pacaya teased apart a palm branch to get at the fiber inside. But the program in Peru is not without challengers. Iván Vásquez, president of the Loreto region, said he had made some enemies for supporting conservation in a region where fishing and logging have been the primary sources of revenue for decades and where oil and gas are seen as the next frontiers. He called himself "the Quixote of the Amazon." "We are part of nature. When we destroy nature, we destroy ourselves," Mr. Vásquez said. He said big logging operations, not small farmers, continue to pose the greatest deforestation threat. The changes in Loreto may correspond to a broader shift in Peru's attitude toward conservation. Last spring, motivated by the signing of a free-trade agreement with the United States, the country set up an environment ministry, which has already started to focus on deforestation. The basket project is the brainchild of Noam Shany, an Israeli agronomist and entrepreneur. A bird-watching trip in 2005 led him to a remote village on the Tahuayo River, an Amazon tributary. There, he said, he noticed striking local baskets for sale in a tourist lodge. Mr. Shany, who had previously sold artificial plants to Wal-Mart and cacti to nurseries in California and Australia, decided to put his retail experience to an environmental use. In 2006 he helped found Procrel, a biodiversity program that has worked with the regional government to establish three vast protected reserves. The basket program is one of several conservation initiatives intended to help indigenous peoples benefit from the conservation efforts. Pitching Peruvian handicrafts to retailers in the United States was easy. "These baskets represent so much more than simply a basket," said Nancy Stevens, manager of retail and wholesale operations for the San Diego Natural History Museum. "When I began to hear their story," she said, "from a local project into a story of sustainability, where they're being developed as a responsible use of the natural resources of this Amazon region -- it just clicked so beautifully with the mission of this museum." Pitching an international enterprise to the villagers was almost as easy. Mr. Shany turned a somewhat haphazard local craft -- women making a few baskets, selling them in a local shop, then making a few more -- into something more like mass production, with higher returns to the producers. Artisans get $10 to $12 for each basket, which sells for $40 in the United States. About a third of that goes into shipping and distribution, and the rest is retailer profit, meaning the company that distributes the baskets gets a little more per unit than each maker. Mr. Shany and Procrel receive nothing. The artisan's cut may not seem substantial, Mr. Shany said, but it is more than double previous monthly earnings. Two years ago, households in this region earned as little as $30 a month selling fish and palm frond roofing at city markets, he said. Today, experienced weavers can earn up to $100 a month. Over time, urban Peruvian employees of the program have brought a new vocabulary to the river communities. Visiting every few weeks, they encourage the weavers to respect deadlines, quality control and inventory requests. On one such recent trip, Mr. Shany delivered a pep talk to his newest recruits. "These stores don't buy one hundred baskets," he said. "One hundred is nothing. Two hundred is nothing. They buy a thousand, ten thousand. You're all going to need to work together." Since the program started, Mr. Shany said, the weavers had not been able to meet demand. "We can't keep up with the orders," he wrote in a recent e-mail message. "We are training more ladies to increase production and also to involve more people." Ms. Rosenthal said that there were considerable difficulties with any start-up operation like this, not the least of which is falling discretionary spending of all kinds by American consumers as the recession in the United States deepens. Other than that, "quality assurance is probably their biggest challenge for selling something retail in the U.S.," she said. But if successful, the arrangement "can bring them much better profits and a much better source of income than in local terms." Still, Trevor Stevenson, executive co-director of the Amazon Alliance, a nonprofit group that focuses on indigenous populations, said it was vital for communities to diversify their income and not count exclusively on crafts, which can be volatile, particularly in times like these. One challenge has been teaching the river communities to shift from consumption to conservation on a large scale. "Here, today is today," Mr. Shany said. "Tomorrow is another day. It's an immediate mentality, so replanting, and not cutting the tree in the first place, is really revolutionary." Eblis Chavez, from San Antonio de Pintuyacu, a village of Iquito Indians that is two days by motorboat from the nearest city, said residents had been slowly won over. "We hesitated a bit originally," Mr. Chavez said, "but it makes much more sense to preserve the trees." A year ago, villagers here walked for hours to find irapay palms, whose fronds are used for the ubiquitous thatched roofs sold at markets, because they had chopped all the trees closer to them. They carried the loads on their backs. "We were slaves of the irapay," Mr. Chavez said. Since last January, villagers have planted chambira groves 10 minutes away, where young fibers used for basket weaving are ready for harvest every six months. "I'm pleased with this reforestation project, which will remain for my children," said Angela Pacaya, who heads the artisan cooperative. The baskets are bringing staples, and stability. "Already, there's more money changing hands. Already we're buying more from the bodegas. Rice, sugar, soap," said Erika Catashunga, of Esperanza, another village, speaking by communal telephone. Ms. Catashunga, 25, is now at the forefront of another venture. 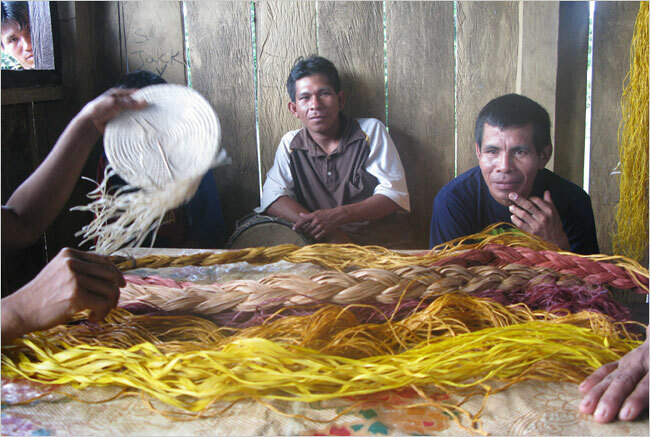 She has just received the first business license granted to a basket weaver with Procrel, establishing her as the manager of a nine-village empresa comunal, or communal enterprise. Its name is Mi Esperanza, or My Hope. Growing up, she never imagined she would manage a global business. "Not even in my dreams," she said.